Among the Soviet poster artists of the photomontage and Socialist Realism aesthetic, Viktor Koretskii (1908-1998) stands out as one of the most iconic. Koretskii attended Secondary Professional Art School in Moscow from 1921 to 1929. He began to work as a graphic designer in 1931 and immediately gained recognition. His professional break-through occurred while working for two major state publishing houses in the USSR. His technique of photomontage was born during the early 1930s and, his version of the art form became consistent with the Socialist Realist dogma of the government. Throughout World War II, he designed numerous propaganda posters for the war effort and worked for government organizations, such as the TASS (Telegraph Agency of the Soviet Union) Windows Studio, for which he designed two posters. Koretskii also designed the first Soviet postage stamp dedicated to WWII. He was a founding designer of AgitPlakat (1956) and he was twice awarded the Stalin Prize, in 1946 and 1949. In 1964, he was bestowed the title of Honored Worker of Art of the Russian Soviet Federative Socialist Republic and in 1964, he was awarded a gold medal by the Soviet Peace Committee. This featured poster conveys a message familiar to the Soviet public on the over-fulfillment of the nation's Five Year Plan. In it, Koretsky uses a handsome, young model-- boyish in appearance yet muscularly mature-- with a look similar to other male models seen on his posters during the 1940s and '50s. The worker is likely not a war veteran but a "veteran of labor" indicating he served the war on the home front in a factory position and he's now helping with the post-war economy. 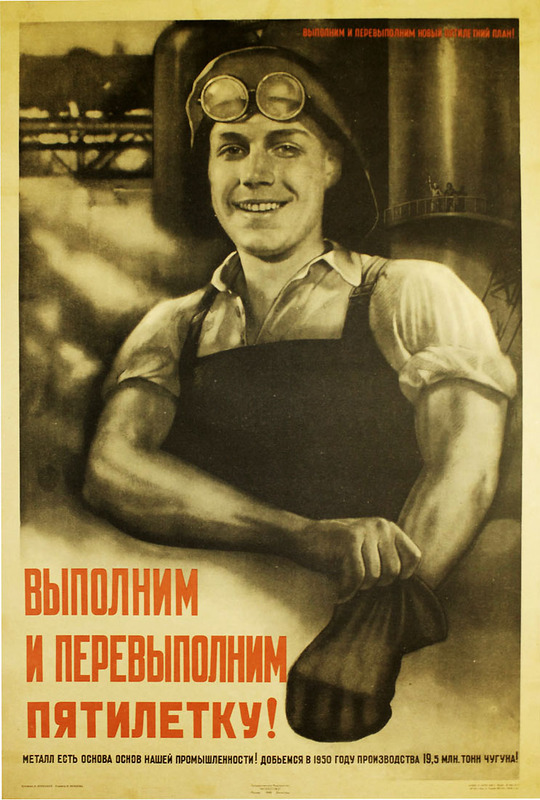 In English this poster reads, "Complete and exceed the new five-year plan! Metal is the first basis of our industry! Let’s make the effort to produce 19.5 million tons of iron in 1950!" The database behind Poster Plakat is the most complete informational repository for Soviet and Eastern Bloc political posters anywhere on the Internet. The system was conceived by the owner of Poster Plakat and developed for the web by Deko Design, Inc. The database uses Algolia search support, a consumer-grade search engine.